1. Go to Services > Authentication > Settings. • Login timeout (minutes) — Determines the inactivity period after which the user is logged out. The default time out is 10 (minutes). • Concurrent login sessions (per user) — Determines the number of log in attempts allowed per user. Verbose – As Normal, but also request, response and result information. This is useful when troubleshooting possible authentication issues. • Normalize usernames — Determines whether all variations of username and domain are normalized into the same format. For example, Active Directory prefers DOMAIN\user, but can accept user, user@domain.com, DOMAIN.COM\user, DOMAIN\user, and so on. 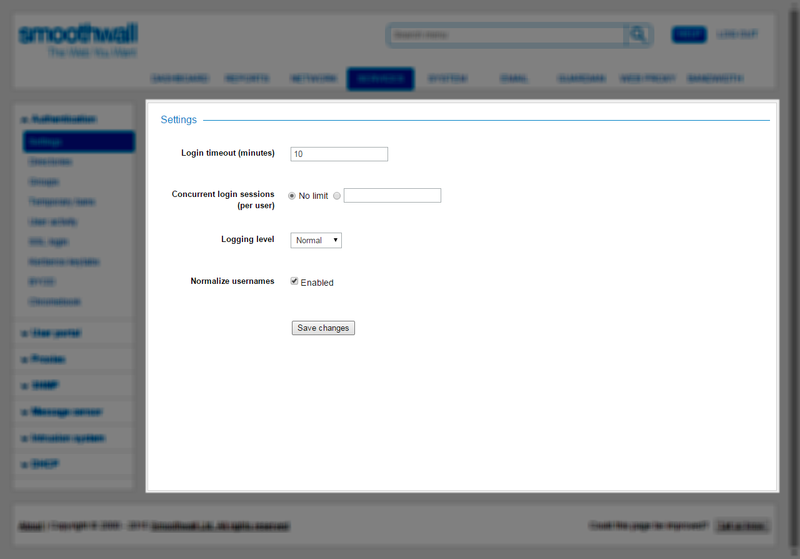 The Smoothwall stores the user-supplied username in the configured directory server’s preferred format. This reduces the number of possible forms of a username to one, preventing users circumventing temporary bans by using a different format of username for example. For a detailed description of each preferred format, see About Directory Services . • Enable group bridging for BYOD clients — Determines whether group bridging is available for those bring-your-own-device (BYOD) clients that are logging in. When enabled (the default behavior), automatically generated firewall rules allow clients to access other networks linked through the Smoothwall, as well as the BYOD network, enabling them to access internal services such as printers for example.